Left the town of Warner Robbins, Georgia around noon and headed south on I-16 toward Savannah. Arriving in the area we decided to check out a Georgia State Park on Skidaway Island that featured camping. It turned out to be one of the best state parks we have seen in two years of winter traveling. The sites were picturesque, large and private. And the trees and plants were the quintessential southern forests. Our view could have been taken from the film “Gone With The Wind”. Hope that’s not an omen…..better check the weather forecast. And as an added bonus our neighbors were a nice couple from Ontario, Canada by the name of Jack and Pat who square dance as well. They invited us to their evening campfire and we had a great time getting acquainted and telling square dance stories. Once again we found a place we had only intended to stop in for the night and decided to spend a few days. This happens a lot and is one of the advantages of traveling without an itinerary. 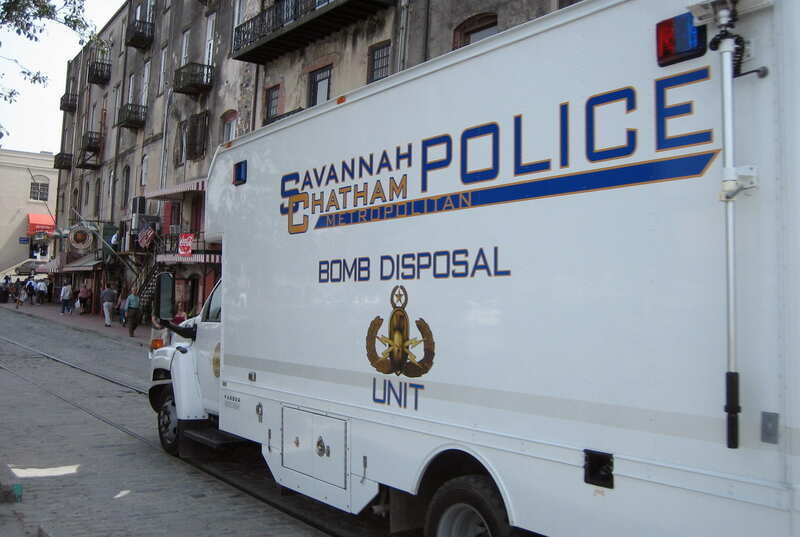 The next morning we unhooked the trailer and headed into Savannah. 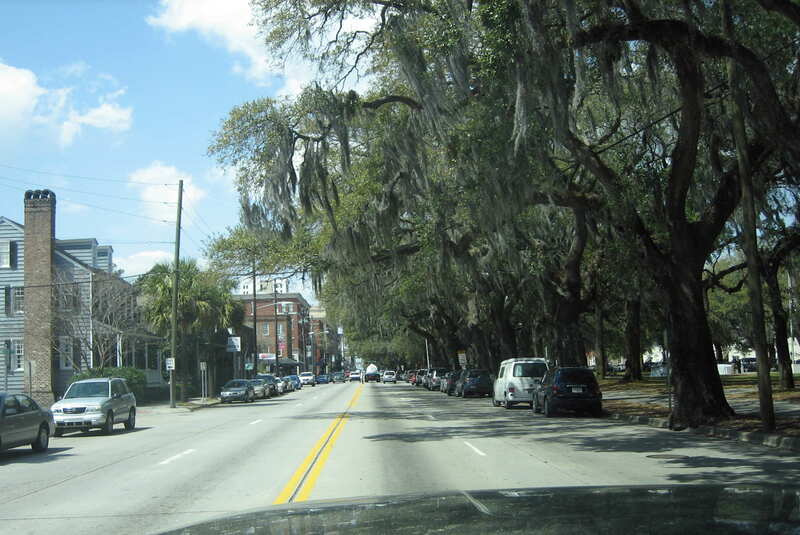 Driving into the historic district we were struck by the beauty of the area. We decided to stop at the Savannah Historic District visitor’s center to learn about sights to see. Signing the visitor’s guest book I added a rather hip comment when I wrote “Savannah is da bomb”. Leaving the building a few minutes later, I saw this strange sight. Must be trouble somewhere; wonder what’s up? Since the police have cordoned off the area we left the truck in the visitor’s center parking lot and walked the width and breadth of the one square mile historic district. 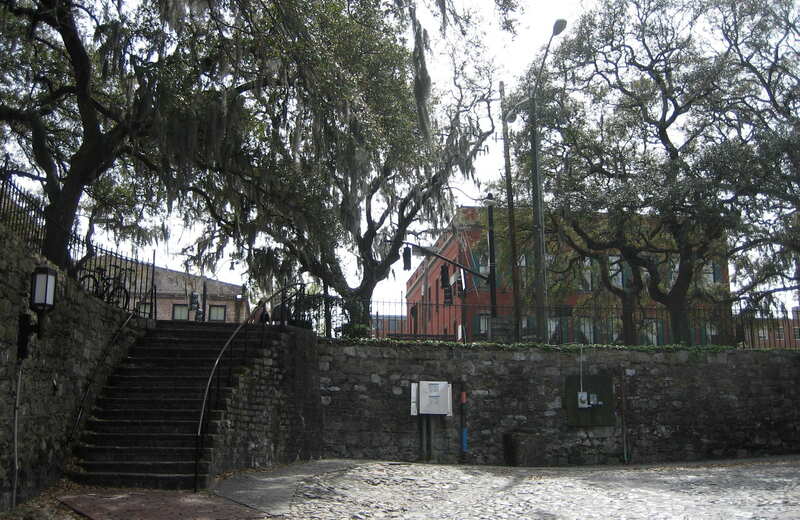 Old Savannah dates from before the Civil War and is laid out on a grid system with periodic “squares”, also called “trustee lots”. These town squares contain beautiful parklands featuring, plants, flowers, fountains and statues. Even though it’s a week day the many quaint town squares had lots of visitors walking about and listening to musicians and watching the various other street performers. On one such town square we met a very nice couple originally from New Jersey who had retired to Charleston. 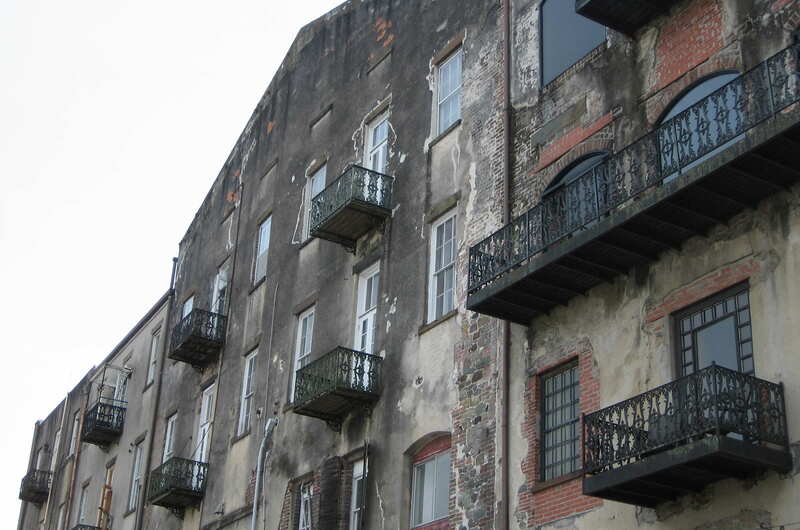 They had chosen to spend the day in Savannah as well. Dan and Janet are former school teachers and have spent a great deal of time during their summer breaks touring the National Parks. I happened to be wearing a T-shirt I purchased in Zion last year and that attracted their attention. We had a great time standing in the town square and getting acquainted. Taking our leave, we exchanged contact information and went our separate ways…..only to keep running into each other, a number of times. Figuring it had to be some sort of destiny; Janet invited us to their home for a meal and to continue the visit. We intend to accept the kind offer when we get to Charleston in a few days. 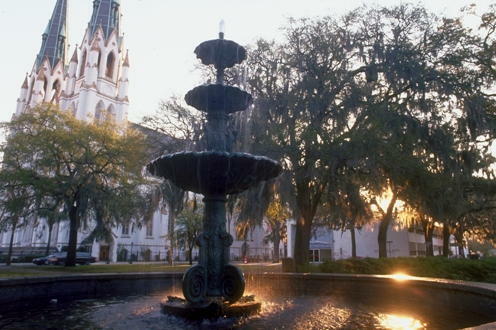 The architecture in Savannah is mostly Federal and Victorian with a hint of French New Orleans influence. 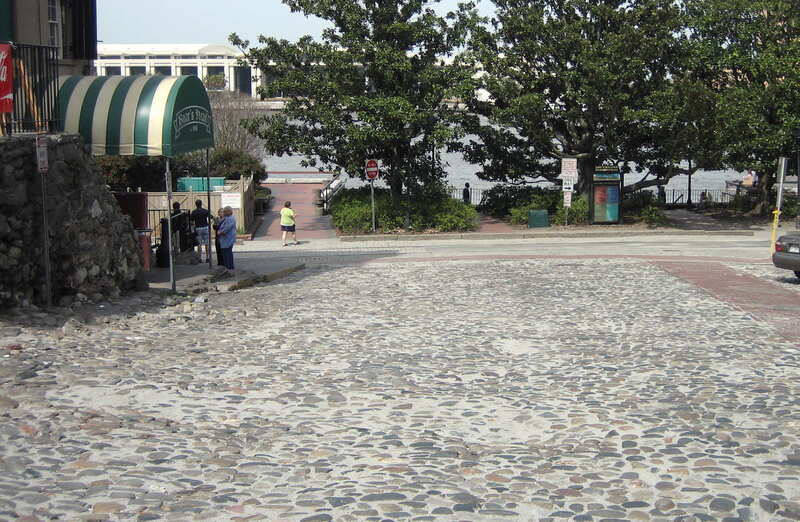 We discovered many of the streets are cobblestone and led right down to the Savannah River waterfront. Walking the length of the waterfront, we were tempted by the many restaurants and finally stopped at Huey’s where we enjoyed an incredible seafood dinner. We had a nice table by the window and were able to watch the boat traffic pass by on the river. Leaving Savannah and before returning to our camp site, we toured Tybee Island which is the eastern most point in Georgia. 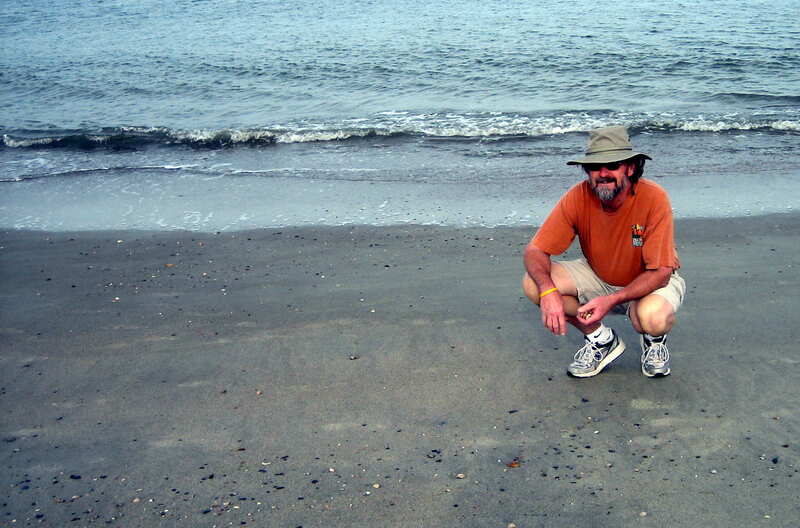 There are miles of exposed beaches so I decided to tend to my rather vast sea shell collection. It is reportedly to be the largest and most complete sea shell collection in the world. You may have seen it…..I keep the collection scattered around the various beaches of the world. 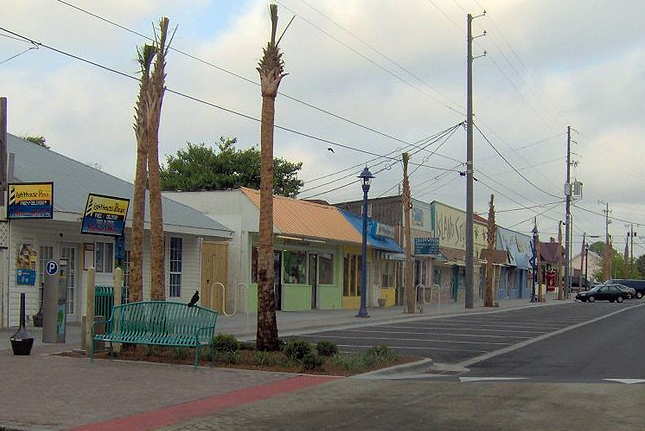 Driving through Tybee Island along the Shore Road we came to this unusual sight. 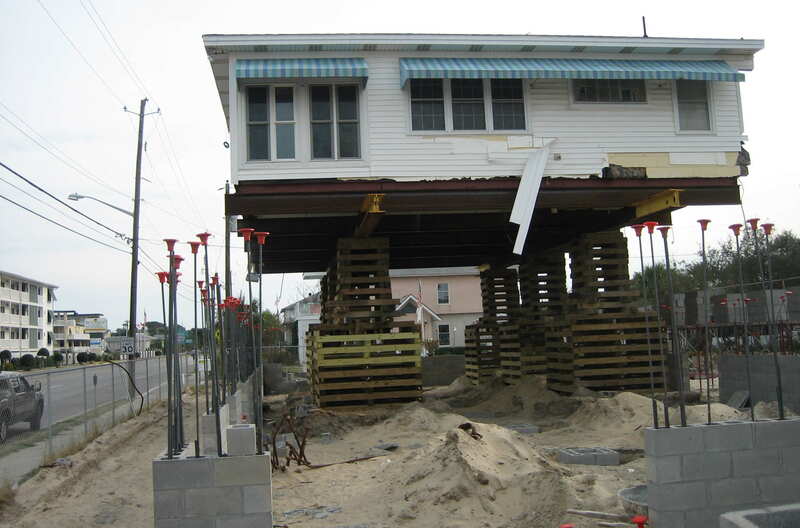 It looks like the homeowner is making a feeble attempt at acquiring an ocean view. The only problem is that the guy right in front of him looks to be starting the same process. This ought to develop into a major skirmish. 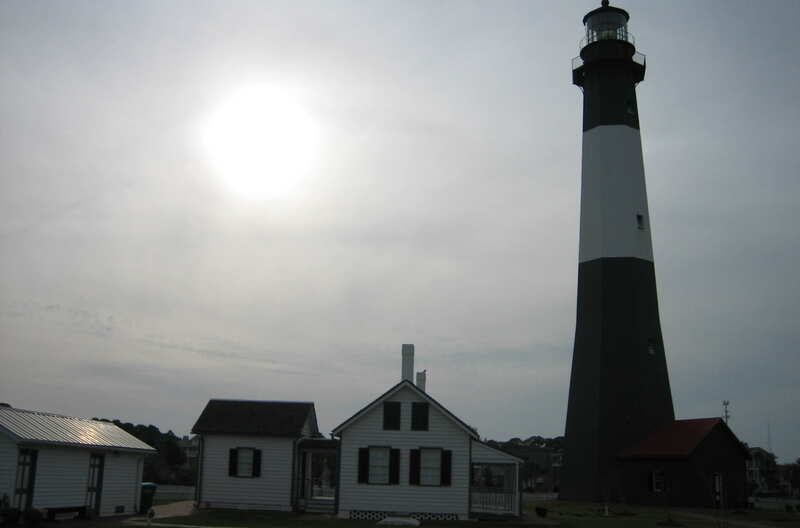 At the north end of the island we came to the Tybee Island lighthouse. 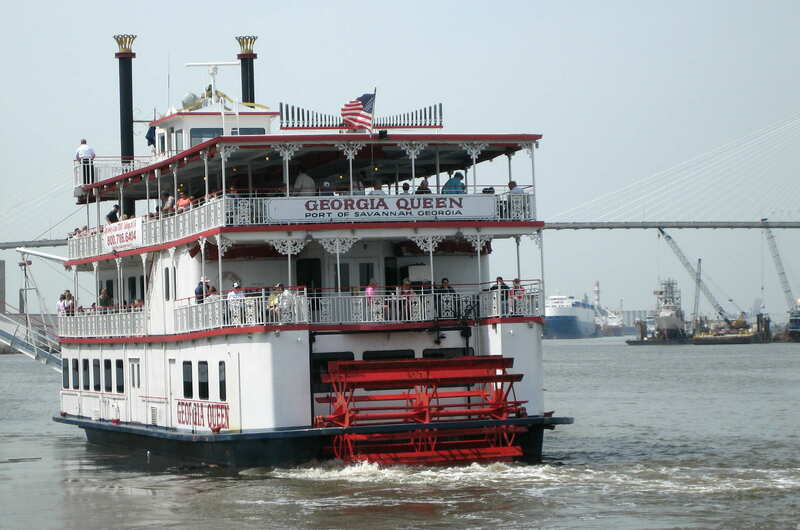 At 154 feet tall this structure has guided ships into the Savannah River since 1736. The light is still a navigation aid but the tower and surrounding light keeper’s quarters now house a museum. An interesting historical footnote concerning Tybee Island is that in 1958 a USAF B-47 Bomber inadvertently dropped a nuclear bomb into coastal waters near the island. Following years of searching the weapon was never found. I’m betting, if you could locate a spot on the island where you had a great view of the sun setting in the west you could simply turn around and enjoy a glow from the east as well. Returning late in the day, we once again met our newly found square dance friend’s around their campfire. An excellent end to an excellent day. 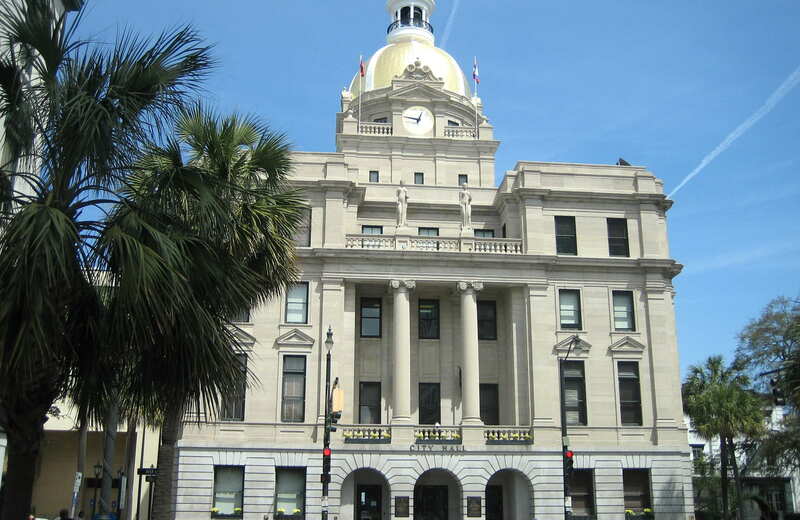 Kit’s Corner: Finally making it to historic Savannah has been a goal of mine for about 40 years. We lived in Charleston from August, ’66 to April, ’70. We did drive down one afternoon but never even got out of the car to look around. I was so awestruck that I always wanted to return. 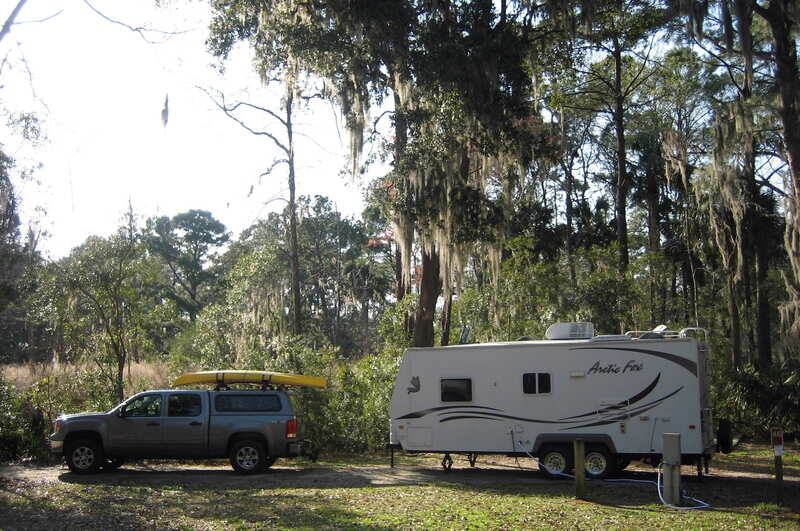 Finding the neat campground in Skidaway Island was a bonus. We definitely hope to return to this area. Thanks for a awesome post and interesting comments. I found this post while surfing for some lyrics. Thanks for sharing this article.